Are you ready for the new Ellsworth Place? All images courtesy of Petrie Ross. Standing inside City Place Mall, it's as if the revitalization of downtown Silver Spring never happened. After multiple attempts to revive the half-empty mall, the answer could be opening it to the street. Representatives from Annapolis developer Petrie Ross Ventures presented their plans for the 21-year-old mall at the corner of Colesville Road and Fenton Street last night at the Silver Spring Citizens Advisory Board's monthly meeting. They want to create several new entrances to the street while reorganizing the mall's interior to draw larger, upscale retailers. Construction could begin this year and the mall could reopen in 2015. 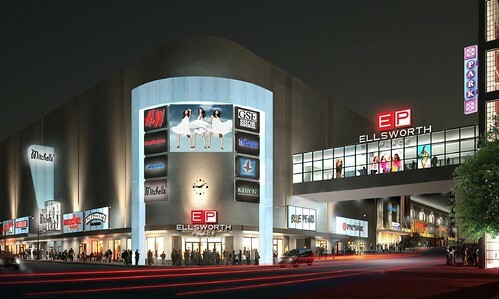 The mall will also get a new name: Ellsworth Place, building on the success of the revitalized Ellsworth Drive next door. "We think it's time for the name to change and the branding to change to send a signal that things aren't the same as they were for 25 years," said partner Walt Petrie. One of the mall's new entrances will be on Ellsworth Drive. Unlike White Flint Mall, which is being redeveloped as an outdoor shopping center, Ellsworth Place will remain an indoor mall. 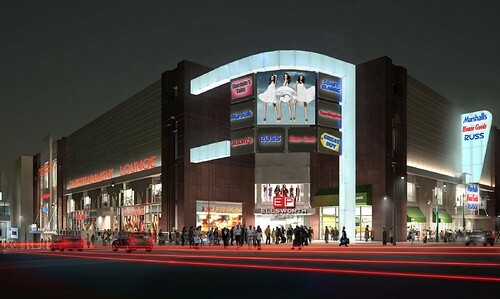 "It wants to be a mall," said Terry Richardson, president of Petrie Ross. "The retailers who want to be here want a mall experience, just friendlier and more pedestrian-oriented than City Place was." To that end, Petrie Ross will improve the mall's connections to the surrounding streets, which already have lots of foot traffic. They'll renovate the three existing entrances to draw people in and place new cladding on the mall's newer section, closer to Colesville Road. Signs, lighting and video screens will hang from the existing metal framework that wraps around the building's older portion, originally built as a Hecht's department store in the 1940's. The developer also plans new entrances on Ellsworth Drive and Colesville Road with escalators leading directly to the mall's upper floors or into a store. Along Fenton Street, there will be a new outdoor dining terrace suspended above the sidewalk to serve a sit-down restaurant. Meanwhile, new signs on the mall's blank rear wall will beckon people standing on the Metro platform two blocks away. Inside the mall's new center court. Inside, Petrie Ross will replace the existing 1990's Art Deco decor with "more of an industrial, clean look," said Petrie. The mall will get new lighting, a new elevator and new escalators. 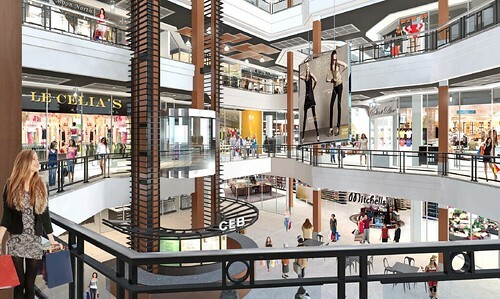 They also plan to rearrange the layout to improve circulation and combine smaller stores into larger, "junior anchor" spaces for national retailers. Petrie said he seeks to bring retailers serving the "moderate and up" crowd, with a focus on entertainment venues, restaurants and clothing stores. Some establishments will stay, like McGinty's Public House, Blue Pearl, and the restaurants facing Ellsworth Drive, along with a "refreshed" Burlington Coat Factory. But the food court, which has just one restaurant, will go away, along Galaxy Billards, which will make way for a new entrance. Several major chains and one "locally owned, regional chain" restaurant have already signed letters of intent to open here, and Petrie Ross is about to sign a lease with one of them. "You're going to recognize this tenant, and be happy to hear who it is," said Petrie. There was no word on what the new stores would be, but attorney Gus Bauman hinted that one of them might be the arts and crafts store Michaels. 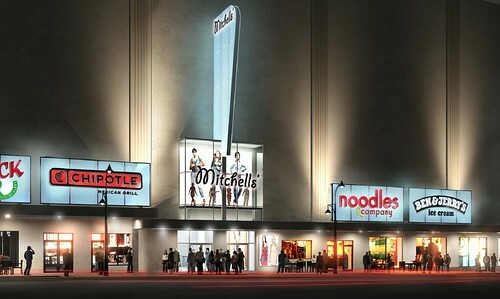 On the fifth floor, a 10-screen movie theatre that's been closed since 2004 will be turned into an entertainment venue with "high-end bowling." Petrie compared it to Lucky Strike. "It's a large venue with a lot of activity that will draw a lot of people," he said. The mall's renovated entrance at Colesville and Fenton. After Hecht's closed in 1987, Montgomery County sought a way to bring shoppers back to downtown Silver Spring, but City Place struggled soon after it opened in 1992. When the Downtown Silver Spring complex opened in 2003, the mall had become an afterthought. Since buying the mall in 2007, Petrie Ross has made several proposals to fix it, ranging from cosmetic changes to turning it into an outlet mall or a Target. As a result, residents were cautiously optimistic about the mall's future. "I'm personally excited about this and I know people want things to go into this building," said Evan Glass, chair of the advisory board. "But this is the fourth iteration y'all have showed us. So why now? Why this?" Terry Richardson, president of Petrie Ross, said that after years of recession, shoppers are ready to start spending again and retailers want to serve them. "National retailers . . . hit the pause button" in 2008, he said. "But year by year, sales are increasing." Residents talked about stores they'd like to see in the new mall, like a bookstore or other "third places" where people could hang out without having to spend money. Board member Praj Kasbekar asked if there could be more local businesses in the mall. "Not everyone is looking for another national chain in Silver Spring," she said. Historic preservation was another concern. The Hecht's wing is a historic landmark, and any changes to the outside will require approval from the county's Historic Preservation Commission. Bauman called the proposed exterior alterations "modest," saying they won't drastically alter the façade. Instead of cutting a hole over the new Ellsworth Drive entrance to put a display window there, Petrie Ross will attach a new sign and glass "shadow box" to the exterior. "Without those entrances, tenants will not come here," Bauman added. "This is what tenants tell us will bring them to Silver Spring." 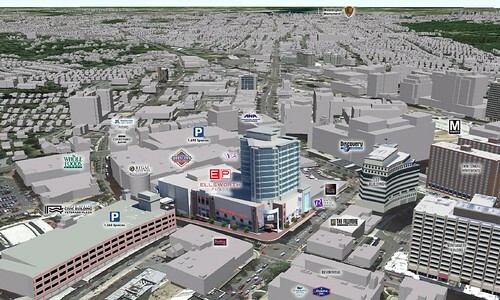 An aerial of Ellsworth Place and the proposed office building on top. Representatives from Petrie Ross are already talking to the Montgomery County Planning Department about getting permits. If they get them this fall, Petrie said, construction could start by "the end of the year" and the mall could reopen within 2 years. There's no word on when work will start on a 9-story, 210,000-square-foot office building above the mall, which was approved with the original project in 1988. The infrastructure needed for the office building is already in place and "we could get the permits tomorrow," said Petrie. The past failures of City Place shows that malls don't always work in an urban setting. But with over 30,000 people working in downtown Silver Spring and thousands of apartments being built, there's bound to be demand for new places to shop, eat and hang out. The key is making sure that they're not walled off, but connected to the larger urban realm. Check out this slideshow of renderings of the new Ellsworth Place. A new name will not change the terrible problems caused by the way this mall was originally configured, which the new plan has not changed. Escalators at either end of each floor drive visitors way out of their way to force them to either end of the store simply to go to the next level. There is only one elevator, and it is painfully slow. If I were a business on the top floor (which Dave and Busters will be), I would insist on a totally revamped elevator plan because the current one is a disaster. Written on 11/30.2015) This is still a terribly messed up mall.